If our neighbor's house was that charming I wouldn't mind one bit that their Christmas lights are still up. 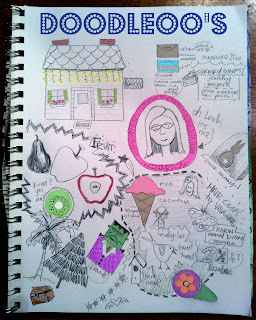 We're big doodler's and colorers (I don't think those are real words) around here. That's the kids go to activity around the house. The hutch in our kitchen is crammed full of their supplies and is organized so that they can get everything out themselves. I think they like the independence of it and it's easier on me for the obvious. Each kid has a drawer for their own stuff, so they know where it belongs and can even put things away by themselves. It's a win win. Our neighbors really do have their Christmas lights up. I've been thinking about sneaking over at night and taking them down. The purse looking things are an upcoming project of mine. They're not purses. More about that later. I have a lot of Shrinky Dink sheets and have been wanting to do something with them. Necklaces? Oh, Hi! It's just me. We've had rabbit roadkill right in front of our house for the past few days. It's a sad affair and as Vaughn says, "Poor, bunny wabbit..."
I've also been trying to think of new felt hair clippies to make for Vaughn. Vance and I like Ed Emberley's drawing books. Cute and easy line drawings. "Frank" is one of his "weirdo's". The kids love fruit and lately they're on an apple and kiwi kick. The pears didn't look so hot at the store yesterday, so I passed. So there you go. That's a snapshot of our week. Exciting stuff, I know. Have a great weekend! I love this post! You need to keep all of your doodle art so you can look back 25 years from now and see what you were up to! Thanks Daven! I do try to keep all my old sketch books. It's silly looking back at them!